The newness of the New Year is wearing off. The holiday glitz and glitter is starting to fade into the background, replaced by the long days of January: cold and crisp. Bodies shuttling around from house to car and back again, icicles forming on the tip of your nose in the time it takes you to escape the heat-filled car and run to the door. Glasses fog relentlessly as you try to run errands. Sun streams over bright white snow, and then it collapses in the West as a dark blanket of night settles on the landscape. It’s the nighttime in winter that seems to swallow me whole, forcing us inside to the lit areas of the earth. The sun long gone, we huddle together and stay warm under our tiny roof. It’s a season that has me looking to collect those around me and keep them close. In the dead of winter, I prefer to cook cozy soups and serve them with fresh baked bread. The simmering pot and warm oven act as a buffer from the wind that whips outside, and it works to keep both bellies and tiny toes warm and protected. 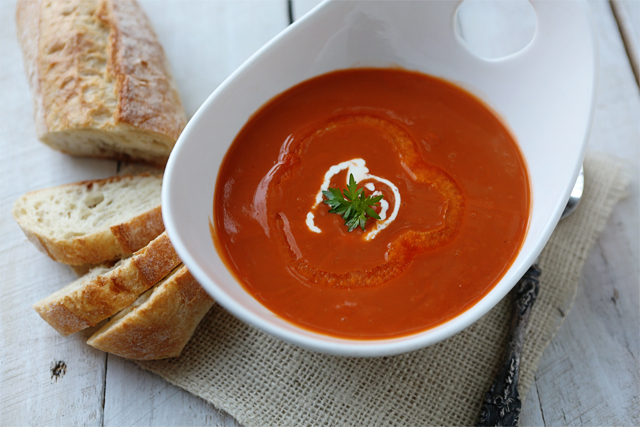 Roasted red peppers add depth to this smooth soup, kissed with parsley and a bit of cream; it is ideal for dunking bits of bread or sandwiches. Turn on your broiler. Lightly rub the red peppers with 2 tablespoons of the olive oil. Broil for 15 minutes until the skin starts to char and is completely wrinkled on the side closet to the heat. Flip and broil for an additional 10-15 minutes until charred and wrinkled. Set aside until the peppers are cool enough to handle, and then remove blackened skin, stem, and seeds by cutting into quarters. Add the olive oil to a large stockpot over medium-high heat. Once the oil is hot, add in the onion and sauté until soft, about 5 minutes. Stir in the garlic. Add the chicken stock, parsley, bay leaves, and the salt and pepper. Add in the peeled red peppers. Bring to a boil, reduce heat and cook, covered, for 15-20 minutes. Using an immersion blender, blend until smooth. Serve immediately with a swirl of cream. What are your favorite cold weather comfort foods? Soup is a definite must in this house. I feel like we have several soups each week because they are so easy, and satisfying. I have never tried roasting peppers, but I do love them when I have had them in the past. Maybe I should give this a try! Yum. I have all the ingredients for this…maybe I’ll ditch my other plans and make it tonight. 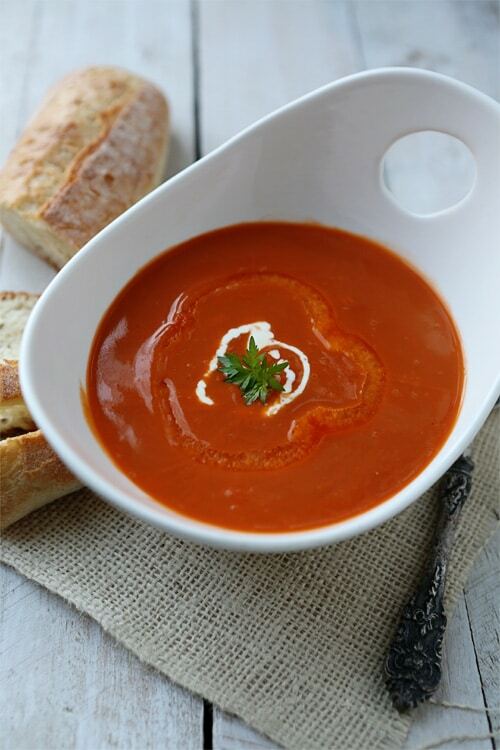 It’s so funny… I used to get red pepper soup from Trader Joes all the time, but I’ve never thought to make it myself. Looks so comforting! I just had red pepper soup at a wedding, for the first time ever. I really enjoyed it, but it was very thin – as thin as chicken broth. This looks like it is a little thicker. I may just try this! I love soup! This soup looks very appetizing–nice photos! I wonder if I could roast and freeze red peppers when I get a bunch in the farm share . . . the loss in texture wouldn’t matter when I stuck the immersion blender in there. I love soup! I recently had my mom’s awesome Italian sausage soup… so good! I’m also a fan of bisques, like tomato bisque and lobster bisque. ah, thanks! got them pinned for later 😉 especially the sourdough. I’m such a sucker for the process. This looks great, but what I really want to know is where you got those soup bowls! Coincidentally, TJ’s is running a special on red bell peppers for $.69/each. Guess what I’ll be making this week! Chicken and dumplings is definitely a cold weather favorite around here. While red pepper is not a flavor my palate loves, the exact opposite is true of my husband. We’ve been experimenting with making him soup on Sunday to take to work all week for lunch (in jars!) – so I think I’ll put this on the weekend plan. Soup and fresh bread is my favorite winter meal. Thanks for sharing this, Shaina! Just following up to say that this soup is outstanding — it exceeded my expectations and I started off with high ones. I’ll be going to TJ’s next week to stock up on red peppers — I want to make a huge vat of the stuff and freeze it it into meal portions. I’m expecting a baby in February and this will be perfect for quick, healthful lunches especially since I used homemade turkey broth. The only changes I made were adding about 1 tbsp of lemon juice to brighten it up a bit and adding my parsley at the end — it’s such a delicate herb and I like it fresh-tasting. Thanks for sharing your soup recipe Shaina! With all ingredients easy to find, it’s cold winter no more! But will the taste still be okay wihtout the cream for garnish? It should be fine. It’ll be a bit less rich, but if cream isn’t your thing, then leave it off. Made this tonight for dinner. It was delicious thanks! Thanks for sharing your easy soup recipe! Those are really easy-to-find ingredients. I made this today and it’s delicious! I have gluten free bread thawing right now so I can make monterey jack grilled cheese to go with it. Or grilled cheese sticks with different cheeses…lots of possibilities 🙂 I’ll definitely need to make a big batch and freeze portions!